When I made my Greek meal of Spinach rice and beans it felt incomplete without a dip so I made Tzatziki. 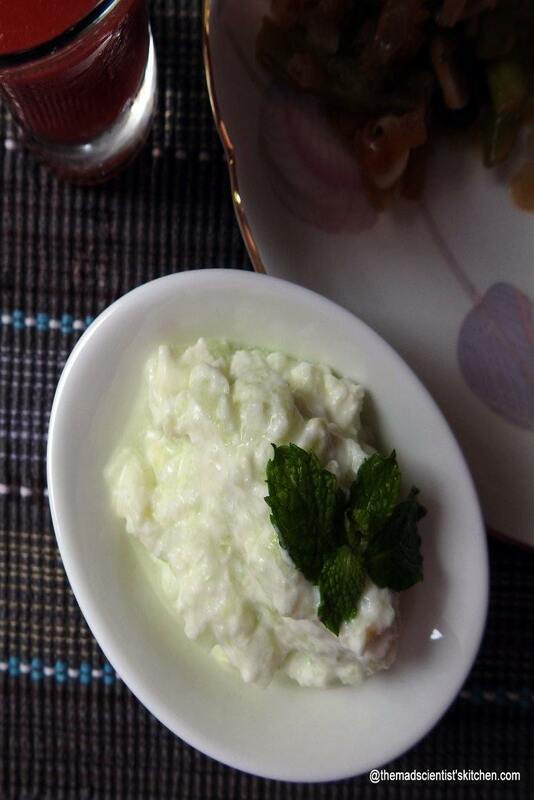 Tzatziki made from hung curds, cucumber and garlic and mint and olive oil was extremely delicious as it was chilled. 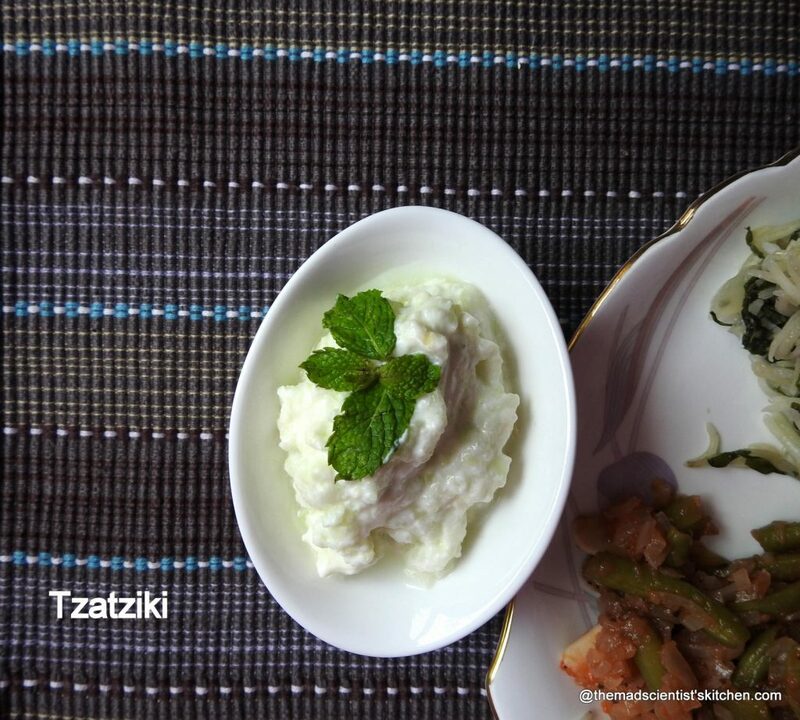 The yoghurt used in the making of Tzatziki is usually from sheep or goat milk sometimes vinegar or lemon juice is also used. The herbs used are dill, mint, parsley, thyme etc. Tzatziki is also called cacik or tarator in some of the Balkan countries. The variations are minor, but then you know me I need to get them right. Feel free to skip this part and go directly to the recipe. 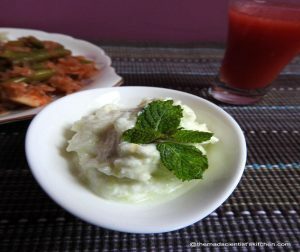 Serbia Tarator, Tarator salata Yogurt, sliced cucumber and diced garlic and served cold. Turkey Cacık Yoghurt, salt, olive oil, crushed garlic, chopped cucumber, mint. vinegar (mostly used is white grape or apple), lemon juice, and sumac are optional. Dill and thyme (fresh or dried) and sumac and paprika may be used alternately. As a Side dish, it is diluted to a soup consistency else as an appetizer it is served thick. Poland Mizeria Same ingredients but uses sour cream in place of yoghurt. There is an Indian version that is also called Sautikai Kosambri/Kadkdi chi Koshimber on the similar lines. Tzatziki a Greek Dip, a yum dip that goes with just about anything. Beat the hung curds till smooth. Add all the ingredients mix well. You can also blend it till well mixed but I did not. Transfer in a covered bowl to the fridge. Serve after at least an hour. This completes my Flavours of Greece for now. 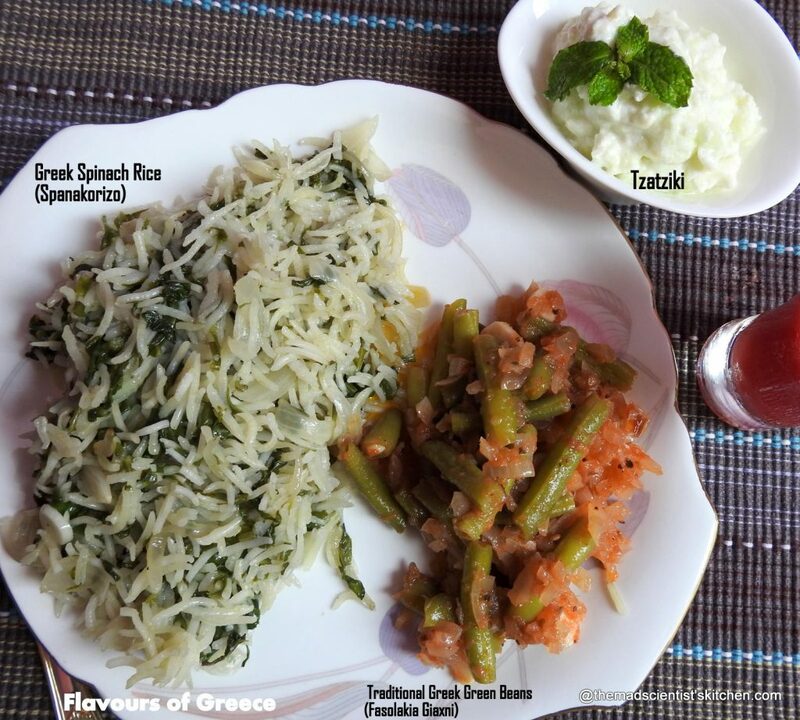 What I shared was Greek Spinach Rice|Spanakorizo and Traditional Greek Green Beans (Fasolakia Giaxni). The dessert was Watermelon with Feta with Microgreens. That is a nice list you have compiled Archana. The whole spread looks great Archana! This is one of my fav dips. So much like our raitha, right. Your Greek platter looks absolutely yum. That is one yumm Greek platter arch! Such a simple meal yet great flavors!! We make cacik often at home, makes a great accompaniment for heavy lunches! Ah this is my all time favourite dip, just love it. That definitely is a wonderful meal! I also like the Greek version of our raita. I too prepared this and absolutely love the flavor of garlic in it. Your entire greek platter looks delicious. Archana, thats one interesting meal you have prepared, each complimenting other..that dip was so good.. I love tzatziki — it is such a simple and delicious dip. I LOVE tzatziki! 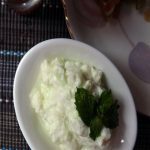 Perfect dip for all Greek recipes!